Lugansk International Airport used to offer flights to Turkey, Egypt and other sunny tourist spots as well cities in Ukraine and Russia, handling as many as 10,000 passengers a day. 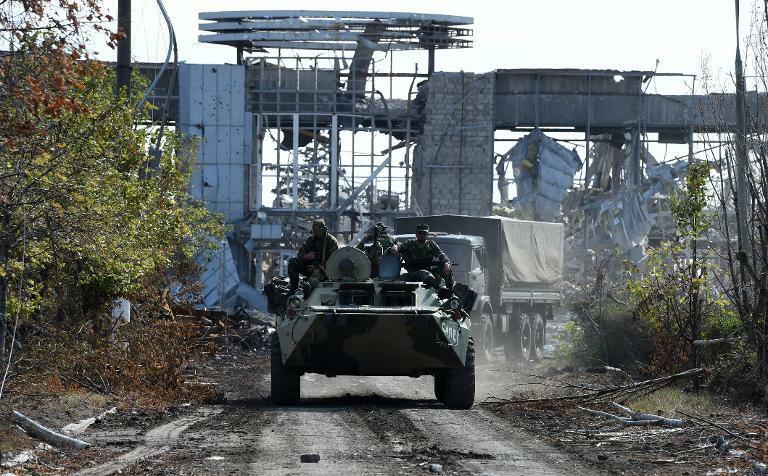 But after almost two months of deadly combat between Ukrainian government forces and pro-Russian guerrillas, the Soviet-era airport has been literally wiped off the map. The main terminal, once a grey concrete and glass building surrounded by tall trees and lush flowerbeds, is in ruins, a vast mangle of collapsed steel, wire and piles of rubble. The main runway and its surround is pockmarked with large craters from rockets or shells and the odd puddle of dirty water. A few small planes sit idly by, their wings in tatters, one listing badly. Tubes from Grad rockets and other munitions stick out from mounts of dirt or lie scattered in the rough grass nearby. 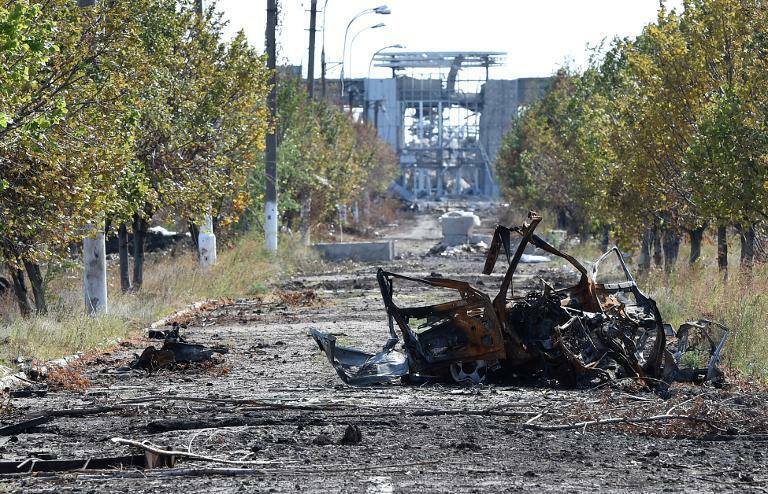 "As you can see the damage is huge," says Alla, a volunteer with the "rapid reaction group" of the self-declared Lugansk republic's army, as she eyes the destruction around her. "There is no way it can be repaired. It will all have to be rebuilt from scratch," says the 53-year-old former hairdresser, her hair scraped up under a green camouflage cap. The airport was opened in 1964 after being built in six months by Communist-era labour known as "shock brigades" who faced the threat of prison if they failed to complete projects in record time. Now, the airport website's "news" section says it is shut for repairs and that the airspace over Lugansk and Donetsk is closed to civilian flights, without mentioning the war. 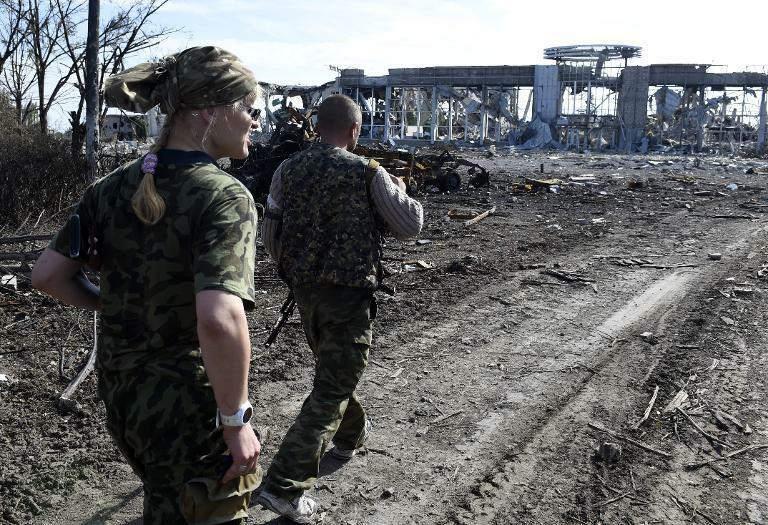 The pro-Moscow rebels are the new masters of the airport, jealously guarding the ruins after weeks of battle that finally saw Ukrainian government forces retreat barely a week ago. Kiev's men remain in control of the airport in neighbouring Donetsk -- also out of action after a massive battle in May. So the seizure of the Lugansk facility represents another decisive victory for the separatists who have made significant advances across the southeast since late last month. Apparently backed by Russian firepower and troops, the rebels who have been waging war against Kiev since April now control an area stretching about 300 kilometres (200 miles) along the Russian border down to the Sea of Azov. The battle for Lugansk airport erupted on July 18, when Ukrainian government forces launched a major "anti-terrorist" operation to dislodge the separatists from the hub. Just a month before, the rebels had inflicted a massive blow on the army when they shot down a military plane as it was coming into land at Lugansk airport, killing 49 personnel. Alla said about 300 in the pro-Kiev ranks were killed or injured in the airport combat, while rebel losses were "minimal". Ukraine's top security spokesman Andriy Lysenko said the order was given on September 1 for Kiev's forces to pull out after they came under heavy artillery fire. "Given the precision of their shots, they were professional gunners from the Russian armed forces," he said. As they left, the Ukrainian forces were instructed to blow up the runway to prevent any aircraft from taking off or landing. Today, men dressed in fatigues, assault rifles slung over their shoulders, pick through the mountains of concrete blocks as an armoured vehicle flying the red flag of the former Soviet Union rumbles past. Suddenly an explosion rips through the air, sending a cloud of grey smoke into the air above a field. "We're doing demining," explains Alla. She says the fighting may have ended for now but insists it is not time to lay down arms. "The ceasefire is a fiction," she says, accusing Kiev of using the truce to bring reinforcements to Lugansk. "We cannot trust (President Petro) Poroshenko or the Ukrainian government." A fellow rebel who calls herself Akula (Shark), her long blonde hair braided and tied with pink elastic, says there will only be peace when Kiev leaves the east alone. "Lugansk is my land, I am ready to die for it," she declares.